You can adjust the door mirrors when the ignition switch is in ON *1. 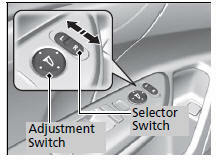 L/R selector switch: Select the left or right mirror. After adjusting the mirror, return the switch to the center position. Mirror position adjustment switch: Press the switch left, right, up, or down to move the mirror.